August 14, 2013 — The Procter and Gamble Company of Cincinnati, Ohio has announced it is voluntarily recalling specific lots of its dry pet foods because they have the potential to be contaminated with Salmonella. The recall has been confirmed in a Food and Drug Administration News Bulletin dated August 14, 2013. The lots were distributed in the United States and represent about one-tenth of one percent (0.1%) of annual production. According to the company, no Salmonella-related illnesses have been reported to date in association with these product lots. The affected products were made during a 10-day window at a single manufacturing site. P&G’s routine testing determined that some products made during this timeframe have the potential for Salmonella contamination. As a precautionary measure, P&G is recalling the potentially impacted products made during this timeframe. No other dry dog food, dry cat food, dog or cat canned wet food, biscuits/treats or supplements are affected by this announcement. 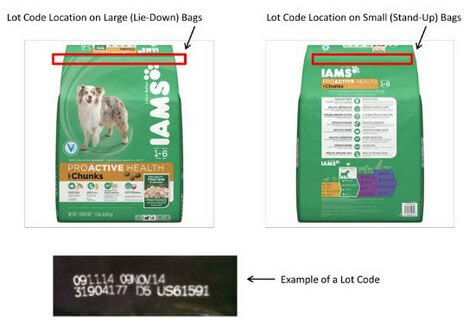 This issue is limited to the specific dry pet food lot codes listed below. This affects roughly one-tenth of one percent (0.1%) of total annual production. Consumers who purchased a product listed above should stop using and discard the product immediately. You may also contact the company toll-free at 800-208-0172 (Monday through Friday, 9 AM to 6 PM ET). Or visit their websites at www.iams.com or www.eukanuba.com.